In 2002, the US District Court for the Northern District of Illinois. 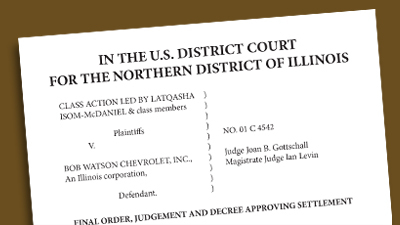 Eastern Division recorded a court order in the case of Isom-McDaniel vs. Bob Watson Chevrolet, Inc., an IL Corporation. This decision became the lead case involving sexual harassment and the critical need to train temporary workers to minimize company exposure to litigation. In 2002, conventional wisdom was that “onsite training” would never fully address this sensitive harassment issue due to the transitory nature of temporary employees. The original Comply America online training program provided substantial legal protection owners and management of U.S. companies. It has been reviewed, endorsed and used by the EEOC, the Practicing Law Institute and Chicago Lawyers Committee of Civil Rights Under the Law, Inc. (CLC), endorsed this innovative online training. In fact, the CLC demonstrated their approval by requiring EPRMA’s Comply America training as a condition of settlement in this highly publicized Isom-McDaniel vs Bob Watson Chevrolet, Inc. case. To learn more about this Landmark Compliance Ruling, Click Here to view the final court order.